Glencoe pipes were made by Matt Marshall up in Ontario after having immigrated from Scotland in 1974. Matt worked at R G Lawrie bagpipes before moving so I figure his pipes are of some sort of Lawrie specification. It is amazing how much easier the Colin Kyo chanter is to play! The Sinclair is my band chanter so it gets a lot of play time. But today, I whipped out the Glencoes with Kyo chanter and my fingers were like, “Aaaahhhhhh, I know where the holes are!” Had a blast. Tenor drones produce a fundamental pitch one octave below low A. Bass drones produce a fundamental pitch two octaves below low A. However, both drones produce higher frequency pitches called overtones. The first overtone of each is the next A up. So a tenor drone’s first overtone is the same pitch as the chanter’s low A. The bass drone’s first overtone is the same pitch as the tenor drone’s fundamental. The second overtone of each is an E. So the second overtone of a tenor drone is an E with the same frequency as the E on the chanter. These overtones, when present with enough amplitude to be heard, manifest as a pleasant ringing sound that seems to hover over the top of the overall drone sound. Many may often hear this ringing only transiently as their pressure fluctuates enough for the ringing to fluctuate in and out. Overtone tuning is very sensitive and here’s why. Say your chanter tunes at low A = 480 Hz, a common pitch in modern piping. This means your tenors should tune to half that at 240 Hz and the bass tunes at half that, 120 Hz. Say we are tuning our tenor drones and one is at 240 Hz but the other is at 245 Hz. They are out of tune. What you will hear is a beating frequency of 5 Hz, the difference between the two frequencies: 245 – 250 = 5; this is the wawawawawa sound produced by out of tune drones. The overtones produce their own beating frequency. For example, our 240 Hz tenor drone will have an E overtone frequency of 720 Hz. The tenor drone playing at 245 Hz will have an E overtone frequency of 735 Hz. The beating frequency between the E overtones is 735 – 720 = 15 Hz. Therefore, if you can hear this beating frequency it will sound very out of tune. That’s fifteen wawawawa in one second! If you tune the second drone down from 245 to 241 Hz, the fundamental beating frequency between the two tenor drones is now 241 – 240 = 1 Hz and the E overtone beating frequency is now 723 – 720 = 3 Hz. The beating frequencies are smaller (not quieter) so our drones are getting closer in tune. What does this have to do with drone locking? Well, if you can’t hear the overtone frequencies all that well then you don’t have to worry about their faster beating frequency. All you have to do is get your drone fundamental beating frequency small enough that it sounds as if the drones are in tune. I believe many pipers have often favored bass dominant pipes because they feel they “lock” in tune better. Locking is piper code for drones staying in tune for a long period of time without the need for retuning. I postulate that the perception that bass dominant pipes lock better is due to the lower amplitude in overtone frequencies that make their overtone beating frequencies harder to hear. Thus, the illusion of drone locking is simply due to not being able to hear one’s drones go out of tune because the fundamental beating frequency is still too small to hear and the overtone beating frequencies are too quiet to hear. Note the difference in the words used. Too small to hear means the wawawawa is so slow it can’t be discerned. Too quiet to hear means regardless of how fast it is, you cannot hear it. I offer an audio sample to guide your understanding. This is made possible by a bum reed the manufacturer has already replaced. This bum reed needed a replacement because it sounds terrible. It produces this huge, nasty overtone that just hurts to listen to. Which makes it a great reed to prove my point, you can definitely hear the fundamental beating frequency along with an overtone beating frequency. You may need to turn up the volume to a setting that is generally considered too loud to be able to discern both beating frequencies. Notice how much smaller the fundamental beating frequency is relative to the high pitched, grating overtone beating frequency. Even near the end of the audio file when the drones are pretty close to in tune, you hear the overtone beating frequency go in and out as I try to find the perfect tuning spot for the second drone. It’s almost impossible and so I will never use this reed in public or even in private, hence why I asked for a replacement. To paraphrase, “single reed” mode locking is specifically the coherence, if you will, of the fundamental with the overtones and occurs very quickly, within the first second of playing a tone on an instrument. “Multiple reed” mode locking is the coherence between two instruments, e.g. two tenor drones. By measuring the frequency of the two tenors of the specially designed pipe they determined it took over 30 seconds for them to frequency lock. They made no determination for phase locking. 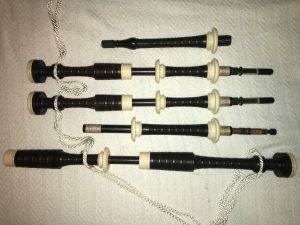 “Instruments made in the traditional way do not mode lock; however, there are several examples of modified pipes with tapered, but not flared, stocks that have mode locked.” Examples given in the article include: John MacFadyen’s Hendersons (mode locked in 20 minutes), Colin MacMellan’s (Lellan’s?) MacDougals, and Robertson pipes in generally (mode locked in 20 to 30 minutes) due to tapered stocks. MacDougal designed the bell of the drones (a low pass filter) to allow only the fundamental and a couple overtones to pass. It is also claimed that MacDougals exhibit papered (tapered?) stocks and internal bore chamfering. Mode locking occurs in about 20 minutes. What’s in a Heritage? Pun intended, but this post is about non-Heritage Kron drones. I bought a set of Kron standard pipes off eBay. First, I spent some time gleaning information from the internet about my new-to-me pipes. The history of Kron pipes starts with the fact that Robertson taught Kilgour and Kilgour taught Charley Kron how to make pipes. So there’s a grandfather in the lineage of pipemaking who was quite a master. 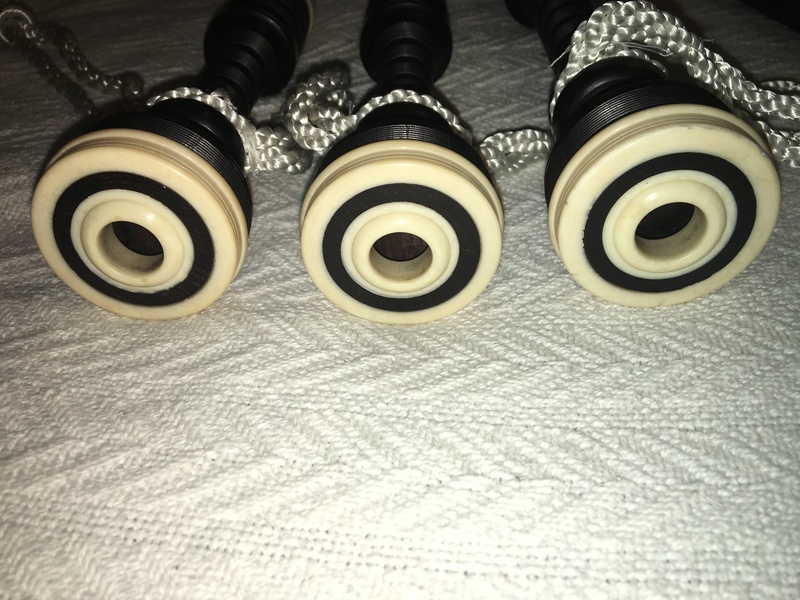 According to this direct account from Charley himself on Gordon MacDonald’s Island Bagpipe “Bagpipe ID” website, my new to me Kron drones were made between 1995 and 1998. Mine are stamped C.E. Kron on each drone piece and are therefore missing the Kilgour stamp indicating they were made after Kilgour left in 1995. Charley states he and Dave Atherton stopped stamping the drones around 1998. The Heritage line of Kron pipes wasn’t released until 2001. Therefore these pipes are the Kron standard model. This was confirmed by many before I bid on them on eBay. Jim McGillivray tells the story of the birth of the Heritage line in this post on the Bob Dunsire forum: http://forums.bobdunsire.com/forums/showthread.php?t=62266. If you look at Andrew Lenz’s collection of drone bore measurements, Shawn Husk and Mark Lee both report the Kron standard bass middle small bore at 0.422″, shy of the Heritage’s 0.438″ and David Glen’s 0.44(0/6)”. I bring this up because my Kron standard has a bass middle small bore of 0.378″. In Charley’s account, at some point the bass middle bore was opened to increase the volume of the bass drone, so I obviously have an earlier set of the Kron standard model before the bass middle was opened. All other specifications on my pipe match those listed on Andrew’s website. It is interesting to note that most pipes have bass middle small bores of 0.420″+. Skimming through the bore measurements, Gillanders, Grainger, and Lawrie are the only other semi-modern pipes with (some) bass middle small bores below 0.400″. Apparently many (including Ron “Ringo” Bowen and Jim McGillivray) thought the bass was (still?) too quiet on Kron standards in 2001 (see Bob Dunsire link above in the 3rd paragraph). I’m curious when exactly the bass middle small bore was opened. Was it before or after creation of the Heritage line in 2001? Charley Kron mentions a review of Kron standard pipes in Piper and Drummer Magazine that was not very good due to a weak bass. So was the bass middle small bore increased as a result of that review or was that review of a Kron standard pipe that already had the bass middle bore opened? Research of the rec.music.makers.bagpipe news group lists many posts by Dave Atherton during his tenure at Kron. This post by madman/Dave on March 12, 1999 indicates the specifications of the Kron pipe hadn’t changed in 12 years. So a Kilgour & Kron pipe should have the same specs as early Kron pipes. This post by madman/Dave indicates, at least up until he wrote the post March 20, 1999, that the bores of Kron standards are the same Kilgour’s going back to ~1968. In this post by Andrew Berthoff we learn the date the survey of pipes was published in Piper & Drummer magazine: February 1996, the same survey that “panned” Kron pipes, as Charley put it. So, the bass middle small bore was not opened in response to the survey since it was in 1996 and at least up until 1999 the specifications of the Kron pipe had still not changed. Of course, Kron has modified his standard design yet again since Dave left in 2007 saying that he modified the bass drone once more, “borrowing elements from the Heritage bass,” to “beef up the sound.” See: http://cekron.com/bagpipes.htm. I don’t see any similarities between reported Kron standard bore specs and Heritage specs so I’m guessing no one has tabulated the new post-2007 Kron standard bores. 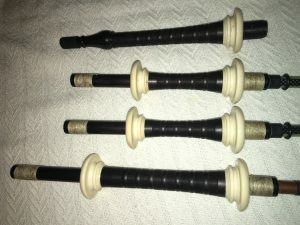 Many have quoted that Kron standards are modeled after David Glen bagpipes. However, if you compare the bore specifications between Kron standards and David Glen, you’ll not find many exact similarities (e.g. the difference in bass middle small bore quoted above). Mark Lee has confirmed the David Glen specs in Andrew’s bore specification sheet in this forum thread. Perhaps they mean they sound like, not patterned after, David Glen pipes. I cannot find any quote where Charley states they were designed after David Glen pipes. Dave Atherton once told me that his Glen style pipe was similar to the Kron standard pipe, though I don’t know if he meant the specs were the same or the resulting sound was the same. I have no idea what David Glen bagpipes sound like so I can’t make any comparison regarding tonal similarities despite their specification differences. Ringo, again from the Dunsire post linked in the 3rd paragraph, posted that his experience with the Kron standard pipes is that they are more like Lawrie pipes. I had come to a similar conclusion based on the similarity between bass middle small bore specs between Lawries I have measured and these Kron standards. However, my conclusions about similarity with Lawrie pipes was before I played and heard the Kron standards. 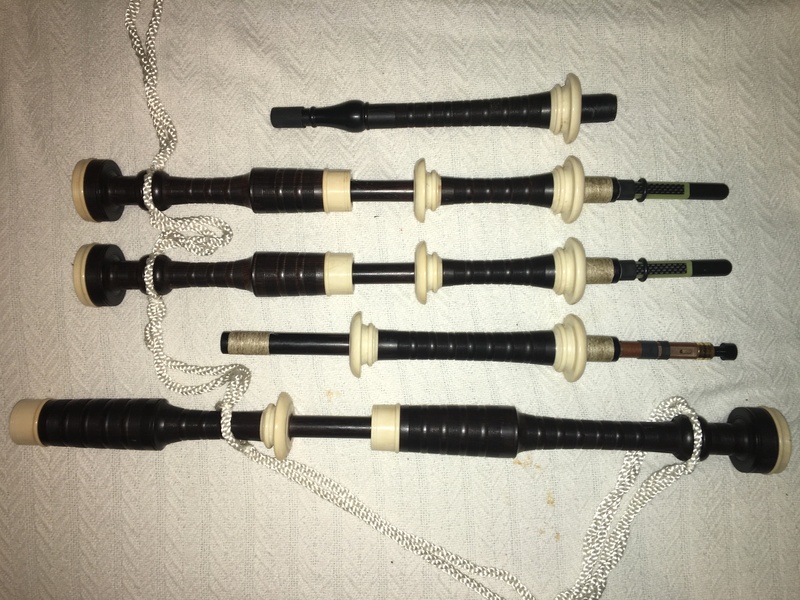 I have a set of Lawrie reproductions in the form of Glencoe bagpipes made by Matt Marshall. I’m not convinced they’re tonally similar, though they aren’t really dissimilar either as I’ve heard wider extremes of bagpipe sound than between those two. 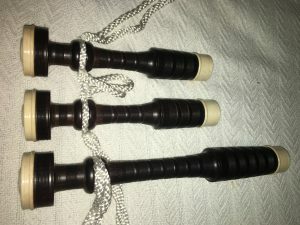 These Kron Standards are unique in my collection of bagpipes (I currently have 8 sets of highland bagpipes). The bells on the drones are very square with no fountain to speak of. The projecting mounts are well proportioned and attractive. 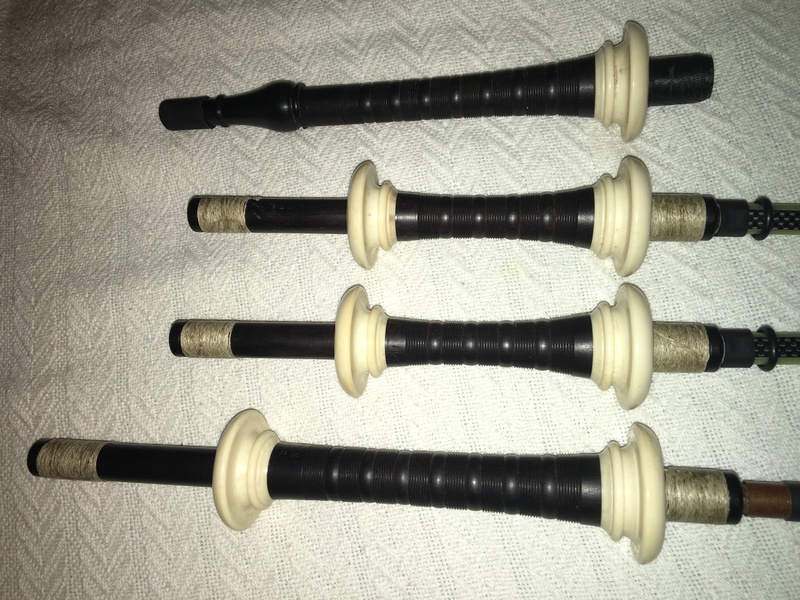 I played them first with the Original Kinnaird tenors they came with from the previous owner. The Kinnaird bass gurgled, coughed, and shut off. A couple hours later I reversed the tongue direction and it started working normally. Until that discovery, I played a standard Ezeedrone bass. Without cheating, what pitch do you think I’m playing at? Then I figured I better switch out some drone reeds so I spent some time mouth blowing through a few. There weren’t too many that were better than original Kinnairds but Canning offered a different tone in the tenors. The Canning bass didn’t fly too well. Here the Canning tenors are accompanied by a working original Kinnaird bass. Ultimately though, the Canning tenors were sucking air so I took them out. There’s nothing like an inefficient bagpipe to make your playing quality drop like a rock. Out came the Canning tenors and in went the original Kinnaird tenors now paired with the original Kinnaird bass. The pipe was efficient yet again and fun to play instead of a chore. I was getting pretty tired by that point (they are tied into a large Gannaway, which is a bit too big, and probably hasn’t been seasoned in 2 years) but I wanted to run a few more drone reeds through so I mouthblew through some more. I plan to try a Selbie bass soon which had roughly the same tone as an inverted Ezee drone bass which were two of the best sounding bass drone reeds, though that’s very subjective. The Redwood bass had a different tone so that might be something to try as well (it’s currently rocking in my Sinclair pipe). I think the original Kinnaird had good solid tone. The standard Ezee bass was quite good too although I have concerns about stability based on pitch fluctuations with pressure. Crozier reeds of all sorts weren’t very promising; I haven’t found a pipe the V2 carbon reeds sound good in yet, though I haven’t been trying very hard. Ezee tenors were too mellow. Not sure I’ll bother with X-Treme, they are going well in my Colin Kyo pipes (ah, but I guess I should…). I have a stash of Rocket reeds so I plugged some of those in last. One set had tenors that were bright like the original Kinnairds but smoother. The bass was also rather big. These Rockets are marked 32281 on the bass reed body, 375 on the bass reed tongue, and 266 on the tenor reed bodies. I don’t recall what pipe they were designed for. A Rocket bass with 263 written on the body didn’t promise anything more than the Selbie/inverted Ezee and Rocket tenors with no number (but I believe were made for Atherton Premier pipes) were quite mellow when mouthblown, so I never blew them in the pipe. I look forward to trying more of my Rocket reeds once I get them back from loan. I’m using a Rocket bass in my Chris Terry pipes (on loan) and Rocket tenors in my Keith Jeffers pipes (on loan). I’m also using old Rockets in my Hendersons currently tuned with G drones, so not sure I’ll try those cause I’d hate for them to work well and have to come up with another set of G drone reeds on extenders. All this just goes to show there’s a lot to be said for matching reeds to pipes! One thing I was quite surprised about is how flat the drones are. If you were trying to guess my pitch without cheating, I was playing at 467 Hz, just about spot on Bb. I’m using an old Sinclair chanter that I’ve carved to play in tune. Regular old Shawn Husk chanter reed. The drones tune fairly normally with most reeds at this pitch, just a tad of hemp showing on the tenors and the bass is only a couple inches off the mount. Tuning screws are all out so the reeds are flatter too but that’s how I set up all my reeds. 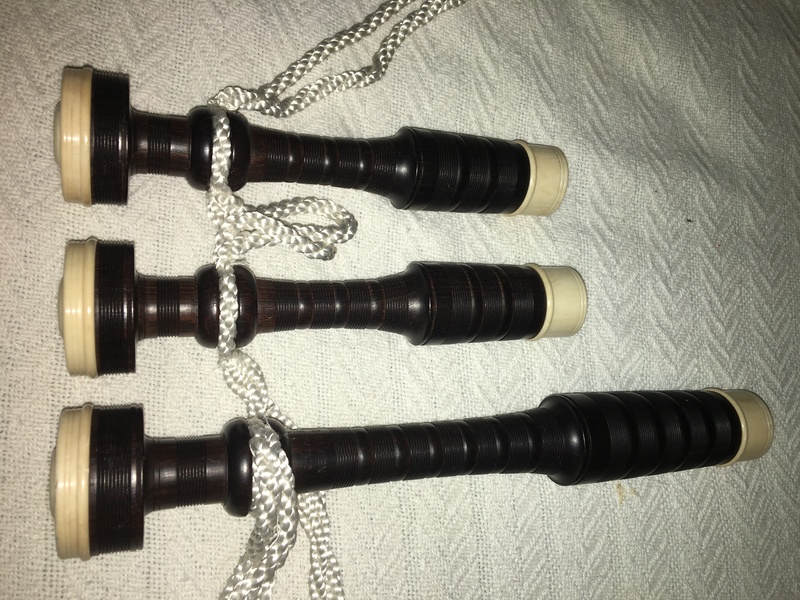 The bass on my old Sinclair pipes that the chanter came with is way higher on the pin than these Krons, albeit with a different reed. These Krons are also very blended. I kept wondering if the tenors are shutting off but then I check and they’re on and when you turn them off you’re like, oh, they were contributing quite a bit of tone. They are very stable pipes with the right reeds. Like my Gellaitry, they sound good with the original Kinnaird tenor reeds which give the tenors a bit of power. There’s a lot to be said for the stability of original Kinnard drone reeds. I wonder how well Evolution Kinnaird’s would work? I don’t have any. The quality of production of the pipes is very good. Even after almost 20 years you could swap the tenor bottoms between tenor tops and stocks without changing the hemp. The tuning chambers are still perfect. There’s no change in resistance as you move the drone tops up and down on the tuning pins. I am thankful for Charley Kron, David Atherton, Mark Lee, Andrew Lenz, Ron Bowen, Bob Dunsire (RIP), and Gordon MacDonald for personal discussions and/or for their various websites and internet forum comments. Documentation is great!